Usually, I have to reread the previous books in the series to remind myself about the main characters, and ongoing storyline. In the case of the Dark Trilogy, Patrick D’Orazio wrote his scenes with such intensity that I remembered very well who Jeff Blaine was, and the horrific journey he was on with his fellow companions in an undead apocalypse. In the first, Comes The Dark: A Zombie Novel , Jeff Blaine has just lost his entire family, doesn’t care about survival anymore, and wants to take out as many of the undead as he can. While he is on his suicidal mission in his suburban neighborhood, he finds another survivor named Megan. The two find themselves trapped by a massive horde, and have to be rescued by George and Jason, the only two people left alive at a failed rescue station. The book ends with the four being taken hostage by another survivor group. 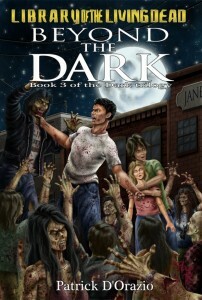 Into The Dark: Book 2 of a Zombie Trilogy , there are many conflicts among the two groups of survivors, and Jeff, Megan, George and Jason realize they aren’t as tight-knit as they thought. After a supply run goes horribly bad, the sequel ends with another freakin’ cliff-hanger. No explanation of the virus is attempted, and the survivors don’t reflect on how the outbreak began or was spread. The reader is pretty much dumped into the zombie apocalypse after it is well under way. Beyond the Dark , the final book in the trilogy, begins with a prologue that recaps the first two books, but I highly recommend that you read the first two, in order to appreciate the relationships between the remaining survivors. Chapter One threw me for a few moments – I thought I had forgotten something after all – until I realized that D’Orazio was just torturing his readers with a little twist in the timeline. Nice. Unlike some authors who lose steam in the end of series, D’Orazio was apparently saving the best for last. I had to read the book in one sitting; there were no slow places where I felt I could depart from the characters’ plight. Everything that could go wrong for the survivors, went wrong in an apocalyptic way – a giant bloody mess strewn from one page to another. The epilogue was like that final stomp to the skull, after having your head bashed over and over by the story. D’Orazio is brutal, and has officially left his bootprint in the face of horror readers. Fans of the D’Orazio might be interested in knowing that additional stories about the characters are available at the Amazon Kindle Store, when you purchase The Dark Trilogy . Originally, the Dark storyline was to follow Jeff, Megan, George and Jason, but it was edited to focus on Jeff’s POV. The extra details are now the “4th book” in the electronic download. 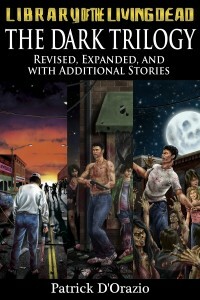 The bonus stories include background details for characters such as Jeff’s survival group, and members of Michael’s survival group. Some of the stories are divided into Part 1 and Part 2. Readers will learn what happened to Megan inside her house before Jeff found her, how George and Jason met, and what happened to Jason’s family. Interestingly, D’Orazio includes a story about Fred and Bobby – the father and son that have the ill-fated showdown with Jeff’s group at the farmhouse. Several stories center on Michael, Cindy and Frank; Cindy’s POV was extremely disturbing. Readers learn just how depraved Michael’s relationship was with Cindy…what went on in the RV. Readers are shown some insight into the behavior of the teens, Ray and Teddy, as well as the quiet Ben. I was surprised to see a story from little Sadie’s POV, but I was disappointed that Lydia wasn’t allowed to tell her tale. The only story that seemed completely unnecessary was the very last story about Michael remembering what his mother was like…I would have preferred D’Orazio to spend the space on a Lydia flashback. Otherwise, the additional stories are a real treat. A. I’ve actually written most of my life. As a kid, I was that annoying brat who would take a one paragraph assignment about the first Thanksgiving and create a fifteen page saga about the drama between the settlers and the Indians, along with drifting side stories of love, battles, and rambunctious youngsters showing their parents the evil of their ways. I loved creating stories about haunted houses, World War II, and the old west too when I was a kid, mainly because my dad and I would watch old action movies and there was always a Creature Feature on Saturday afternoon after the cartoons were finishing up that I would watch. I loved coming up with my own variations on what was up on the screen, along with detailed drawings of the action I was fabricating in those stories. That all morphed into a geek who loved to play Dungeons and Dragons as a teen and the desire to be the Dungeon Master so I could create my own adventures, with way too much back story for the characters. I created my own world in D&D, complete with a five thousand year history, which was a blast to do. I wrote my first high adventure novel as a teenager that tied in with that world, and mostly dabbled in sci-fi and fantasy until I had a eureka moment a few years back and decided I really wanted to write about zombies, among other things. Writing has always been a way for me to not only create something new, but to provide me an element of control over that creation, even when the characters always tended to have a will of their own. They shaped what is going to happen, regardless of my desires for them. Horror lends itself to that in some really exciting ways for me. Q. How did you decide on the title theme for your Dark series? A. Well, originally, this was going to be one book, and I had really beat my head in trying to come up with something that would sound different than the countless “dead” variations for zombie books out there. I remember it hitting me while I was taking a shower one morning: “Comes The Dark.” Just don’t ask why it hit me in the shower, but I think perhaps I had slipped and bonked my head against the wall, heh. I had heard that turn of phrase before, and it seemed to encapsulate the duel meaning that I wanted for the title for this particular story. The world goes dark all around you and there is even more darkness coming from within because of what you have been forced to deal with. I later rediscovered where I had heard that turn of phrase, which was from the Rime of the Ancient Mariner by Samuel Taylor Coleridge. It appears before the first chapter in the book. Later, when it became clear that this was going to become a trilogy, I had to develop titles that tied in that same theme. I went crazy trying to come up with all sorts of overblown titles that would complement Comes The Dark. Then someone suggested something far simpler. At first, “Into The Dark” and “Beyond The Dark” didn’t resonate with me for some inexplicable reason, but after a few days, I couldn’t see it any other way. It made perfect sense. The Darkness rushes in, settles all around the characters in this devastated world, and in the end, all they can hope for is they can somehow manage to get past that darkness that permeates everything and everyone. Q. How do you develop your plots and characters? Did you struggle with any of your Dark characters? A. The first character that was created in my mind was George, who actually remained consistent throughout the entire process of writing the trilogy. I knew exactly what was going to happen to him from the very beginning, and somehow I managed to stay true to that throughout the process. The character always agreed about who he was and how he would react to things, even when the plot shifted and changed several times. He was the one “pure” element that stayed the course, because I think it was necessary to have that sort of anchor for everything else on this crazy ship of madmen and madwomen. The key details of his story were going to be shaped into a short story long before I ever thought of writing a novel. I think I had a dream about George years ago, and it stuck with me for a very long time…until I could get it down on paper. The concept of Ben was the same-a short story idea that melded itself naturally into the plot of the trilogy-one that had stayed with me for a very long time. Jeff came after that, and all I knew was that I wanted an everyman-but someone who would be persistent despite his apparent desire to go out in a blaze of glory due to the loss of his family. But Jeff changed more than anyone through the writing and re-writing of the trilogy. He morphed into a unique personality that ended up being a lot different than what I had originally intended. He became a lot more vulnerable, a lot less confident in what he was doing as I wrote him. He was really hanging by the skin of his teeth by the end of the process. That his mind didn’t snap completely sometimes amazes me. What was really cool was that I was blind to a lot of how he would be perceived, and some of the comments on what people thought of him were fascinating to me, because they were a lot different than what I expected, especially among some of the beta readers, which helped in his transformation. Megan was somewhat the same. I knew I wanted her to gain strength in time, but to appear fragile at first. She was a foil for Jeff, but one that was filled with compassion and tremendous strength that might not be visible throughout a lot of the story. She became more than I had ever expected she would, and I loved how she sort of grabbed me by the throat and told me how to write her. Jason and George played off each other a lot. George, for the most part, remained steady, but Jason tweaked him, allowed George’s guilt to bubble to the surface more often about his priorities. It also helped to show that despite both their misgivings, they needed each other a lot more than either would admit. Most of the characters introduced in the second book were sort of a blur when I first started writing. My original notes had them being super survivalists who knew everything about everything and they overwhelmed the foursome that stumbles into their mists with ease. Of course, once you start writing things down and really shape characters, they tend to change, a lot. Michael became more neurotic, Cindy more…Cindy-like, and Frank started screaming at me to tell me to stop being a wus and give him more of a hefty role. Lydia was created after much of the other characters had taken shape and defined themselves. I felt she lent a little more humanity to the second group than I had originally planned. Like Megan, she had a quiet, almost imperceptible strength on the surface that really shines through as you get to know her better and dug deeper; especially after her conversations with Jeff and Jason in the second book. I think a lot of the back story that became “The Dark Stories” that appear in the e-book version of the trilogy helped really shape the characters for me. Telling their back stories like that helped guide me and hopefully let what I wrote in the trilogy about each character stay true to who they were and who I had intended them to become. Writing all of that gave me an understanding of where they had come from, even though they all ended up transforming a great deal from my original intentions for them. That can be exhausting, because it forced me to rewrite massive chunks of the story to accommodate those changes, but it was all well worth it. It fuels the process and keeps you going when you thought you were finally getting close to finishing the story, but realize you have another twenty thousand words to reconfigure. Q. How do you think you would react if you found yourself in Jeff’s situation with the zombie apocalypse? A. Well, some folks joked that Jeff is supposed to be me, which is only true in that we are both suburban husbands and fathers. Beyond that, I doubt I would ever be able to react as he would if I lost my family. I think it is far more likely I would be closer to George in how I would react to things and how desperate I would be to be with my family no matter what, though it is hard to tell how things would really go down. Most of us zombie fans have discussed how we would react to the apocalypse on many occasions with others like ourselves, which is fun to contemplate in theory. In reality, my fear is that all that planning and all those survival kits and “weapons” I have wouldn’t do me much good, because I would more than likely be a quivering pile of jello despite thinking I am prepared for the apocalypse. It’s all fun and games until someone pokes an eye out, right? Or gets their eye ripped out of its socket by a rampaging dead guy, heh. Then all bets are off. I still would like to believe that I would be willing to help those around me instead of cowering in a corner as people get ripped to pieces. It is sort of that moment of truth thing-would you stand tall even if you knew you were doomed, or would you keep running despite the reality that there is nowhere left that is safe? Mulling over grim possibilities like that is part of the reason why I felt compelled to write these books. Toss someone into the meat grinder, like I used to do with the characters in Dungeon’s and Dragons, and see who manages to accept their fate and maintain their humanity, regardless of how easy it would be to toss it to the side because there aren’t any rules to play by anymore, and the world has become an ugly, evil place. Q. Why should fans of zombie films read zombie stories? A. That is the question that often gets asked at conventions. You get a lot of movie fans who pass right by the authors tables because so many of them don’t make the connection that books are a tremendously cool extension of the genre. Movies give you an exact scene, with no requirement to have any sort of imagination about what is taking place. People say things, and action occurs. It’s simple. I love movies, but books force you to fill in all the gaps with your mind. An author only gives you the bones of a tale. Even if they are very descriptive of a particular scene-the setting, the people, and action, much of it is crafted in your imagination as a reader. Your mind is a very fertile playground. So in other words, nothing on screen will ever compare to the imagery that appears in your head when you read a novel. That definitely applies to well-crafted zombie novels. When you see zombies attacking a woman on the screen, the director has to show you exactly what you need to see so that you get the point. A lot of times they feel the need to hit you over the head with a sledge hammer to make their point. Don’t get me wrong, that can be a good thing. You have less than two hours to get your point across with a movie, so always keep it moving in the direction you need to. With a book, it can be a LOT more vague, which allows for all those parts of your brain that shut down when you watch a movie to get reactivated. An author can’t give you every detail…so your mind likely will give you something far more graphic and detailed about that same assault you are reading about on the written page than you would ever see in a movie. That is what I love about books in general and the zombie genre in particular. I can imagine far more horrible and vivid things in my mind than I have ever seen in a movie. So if you are a fan of the genre, the idea of reading a zombie book and letting your twisted, creepy mind fill in those blanks will give you far more nightmares, and more satisfying ones than you could ever get from a movie. Yes, I did say far more satisfying nightmares. Q. Where do you hope to take your writing in the future? A. I want to continue to write more zombie related novels and short stories, but at the same time expand my horror repertoire, which I have been doing with the short stories I’ve written over the past year or so. I also want to continue expanding into other genres as well, with a return home, as it were, to science fiction and fantasy, because I think they deserve a fair shake after all the atrocious junk I wrote when I was younger that was all buried and hidden away. Whatever I do, I want to keep challenging myself to get better and better with each thing I do. I’ve learned so much over the past few years, but know I still have a long way to go. I think a part of that is forcing myself to write in genres that I might be reluctant to dive into. I was terrified of bizarro, so I forced myself to write a short story for a bizarro anthology, which got accepted, shockingly. I wrote some erotica, which again was not something I would have ever thought to get involved with. I want to try my hand in other areas like that over and over again and whether I get something published or not, I know that I gave it a shot, and hopefully expanded my horizons in the process. But no matter what I do, I want to keep pushing harder and make some mistakes along the way so I can keep getting better at this stuff. I guess I should also plug my blog, ﻿﻿www.patrickdorazio.com, in case anyone wants to keep up with what I’m doing these days and how my writing progresses. It’s too bad they didn’t let him stay on his zombie hunt. I’d like to hear a good story about picking them off and the fun ways to do it.